Pincushion world is a rich and complex universe in itself. There are simple pincushions (like cushions used to store pins), but also bracelet pincushions, glass jar pincushions, tea cup pincushions and all types of shapes you could think of. Of course there are some funny takes on this craft room classic: hedgehogs, cactus and voodoo dolls (of which I plead guilty). Today I share five of the best ones I have found with tutorial available. I used this one to make the pincushion shown at the top of the post. This is my favourite because: 1) It is pretty, 2) it is funny, 3) it demonstrate a clever technique to create these open circles. 2 – French knot heart pincushion by V and Co. Combination of linen and French knots is a winning one. This pincushion is just yummy but I would be afraid to spoil it if I was to stick pins in it. The pattern is for sale on Mimi’s Etsy shop. Who wouldn’t like a pincushion that could double as a fairy country house? This is a perfect project to use up fabric scraps. Just be careful the cat doesn’t steal your pretty mouse pincushion! There is something very appealing to me in this design. Maybe this is the neatness of the square tightly wrapped with ribbon. More probably because it combines several obsessions of mine: bold colours, ribbons and buttons! There are many other tutorials available out there. I avidly collect them with other crafting help goodness in my Crafting for crafts Pinterest board. It would appear that thete are as many pin cushions as the imagination! I know what you mean about the presents. There is something about them….. These are so cute! 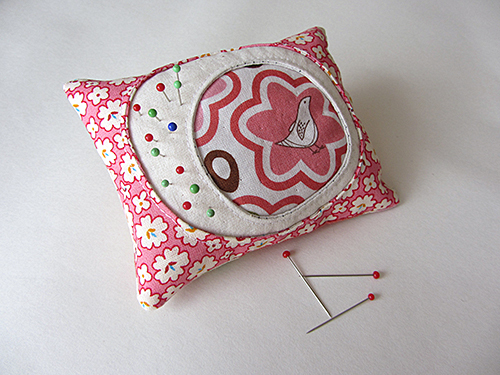 I need to make myself a pin cushion. I have made my girls little cupcake ones for their sewing baskets, but never one for myself!